I had about 4 or 5 of these burned on the same target with no luck. I even tried it along with a command candle with ambiguous results. Some reports were favorable, some said he was concentrating on other things and communication would be sporadic. I have not heard a peep from this person in almost 3 months. 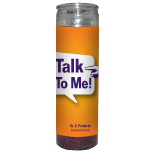 I do believe in the candle magic I just think if the person really doesn't want to talk to you, no candle is going to help the situation! Date Added: 04/21/2017 by J. F.